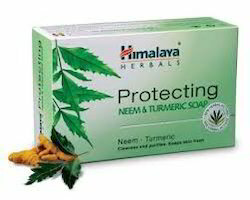 Himalaya’s Almond & Rose Soap combines 100% natural actives to restore the body’s water content. This non-greasy soap leaves skin feeling soft, supple and toned. Relying on our expertise in this domain, we are engaged in presenting a wide array of Himalaya Baby Nourishing Soap to our customers. This Himalaya Baby Nourishing Soap keeps your baby’s skin nourished all day long. Besides, these products are available as per the multifarious requirements of our clients. We are engaged in offering Himalaya Gentle Baby Soap. - Indian Aloe Possess skin conditioning, emollient, and soothing properties, and keeps skin soft and supple. - Olive Oil, enriched with Vitamin E, nourishes, protects and softens skin, preventing chafing. It has soothing properties, which keep baby’s skin healthy and soft.